Set includes 2 oven trays - small and large, large roasting tin, multipurpose crisper, pizza pan, loaf tin, biscuit tin, square cake tin, 12 cup bun sheet & 12 cup muffin tray. Deep Roasting Tin: 37.5 x 27.7 x 6.5 cm approx. Bake any dessert you choose with this oven tray set. Each grey tray in this set of 10 is made of durable carbon steel. Their non-stick surface makes it simple to remove cookies, loaves and other baked treats while they are easy to clean in a dishwasher. 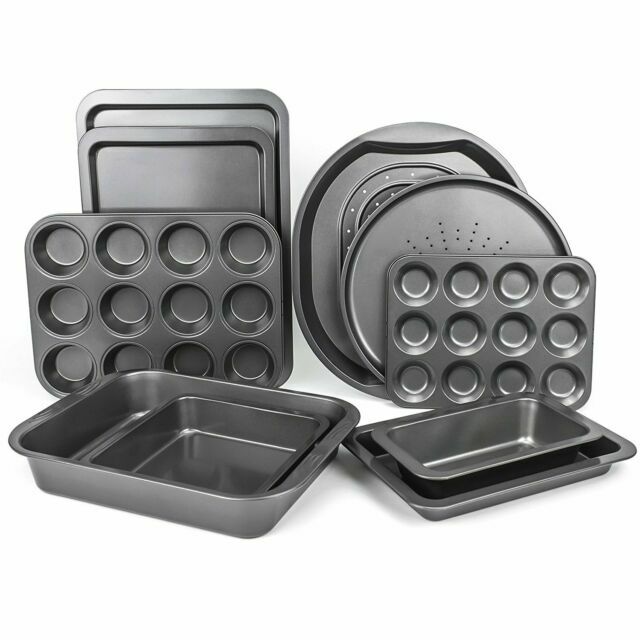 This set includes two oven trays, a roasting tin, pizza pan, muffin tray and loaf tins of various sizes. I received the pan set and was very pleased by the size of the pans. Usually when I've bought oven pan sets from looking at there pictures they are smaller than you think but all of these were a nice size. Price was low for the size as well. Not had any problems with them, when washing the non stick covering does it's job and everything I've cooked just wipes off. The quality of this non stick product seems to be very good up to now and also easy clean. The ultimate test will be Yorkshire puddings, hopefully they will not stick also. l am very please with these 10 items. they look like a good quality. and value. they are the best i have brought in a long time.